Published in association with the American Land Publishing Project. The region known as Bears Ears in southeastern Utah is a landscape of unsurpassed beauty anywhere on Earth. It is a land filled with more than 100,000 documented Native American archaeological sites, some dating back more than two millennia, that have been revered like mini-Sistine Chapels for the Native people. It is also home territory for Mormon settlers who ventured here from Salt Lake City after the Mormons' long journey from persecution in Nauvoo, Illinois, during the 1840s. Sacred land to many, President Barack Obama, on December 28, 2016, issued a presidential proclamation to protect nearly 1.35 million acres as Bears Ears National Monument, seeking compromise between the Indian Nations, who wanted nearly 1.9 million acres, and those in Utah such as Congressman Robert Bishop who sought a monument of 1.3 million acres or who resisted any designation. President Obama also arranged for Indian Nations to work collaboratively, for the first time, with federal agencies to set policies for managing Bears Ears National Monument. Stephen Strom's photographs capture the singular beauty of Bears Ears country in all seasons, its textural subtleties portrayed alongside the drama of expansive landscapes and skies, deep canyons, spires, and towering mesas. To his sensitive eyes, a scrub oak on a hillside or a pattern in windswept sand is as essential to capturing the spirit of the landscape as the region's most iconic vistas. In seeing red-rock country through his lens, viewers can discover the remarkable diversity, seductive power, and disarming complexity of Bears Ears' sacred lands. Strom's photographs evince the full spectrum of emotional responses: exhilaration and disorientation, contemplation and serenity, passion and gratitude for the wild places and archeological treasures that now belong to all Americans. Rebecca Robinson's informative essay provides historical context for how the national monument came to be, and poet Joy Harjo's original poem serves like a prayer to the book and the land. 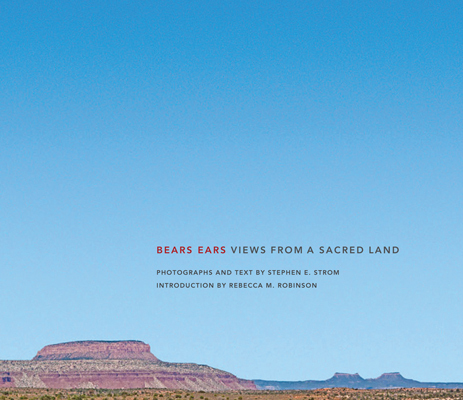 Bears Ears: Voices from a Sacred Land is a celebration of the foresight of visionary leaders, from President Teddy Roosevelt, who advanced the idea of national monuments in the Antiquities Act of 1906, to President Barack Obama, who set aside this land known as Bears Ears that is sacred to so many. "Bears Ears is a beautiful volume that makes it clear why this visually striking and culturally rich landscape needs the protections of the original national monument designation."